Your circuit tracer can let you know whether or not a circuit is live or dead, but a poorly-made one won’t be able to do much at all. From a lack of sensitivity to a nearly useless voltage range, we’ve seen all kinds of issues in badly made wire tracers. On the other hand, a well-made circuit tracer finder will be lightweight, durable, and will make your job a lot easier. Over the course of this guide, we’re going to review some of the best products in the electrical circuit tracer category, with models from companies like Greenlee, Fluke, and Southwire. The first live circuit tracer on our list is the Ideal Circuit Tracer. The brand name here is really on point – this wire tracer combines excellent build quality with a wide voltage range. You can trace circuits that range from 120 volts up to 240 with this model, and it also features automatic operation that makes it welcoming for beginner electricians. Along with finding the correct circuit breaker, this model can also see whether or not it is powered. 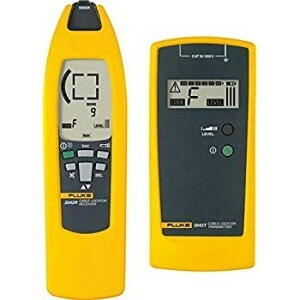 The tracer also comes included with a quality non-contact voltage tester, making it a great set for electricians who are just starting out and may not have all of the necessary equipment yet. The Ideal Circuit Tracer features excellent build quality, making it one of the more durable products on this list. You won’t have to worry about dropping this ac circuit tracer on the job, as the outer housing is more than resilient enough to withstand a little bit of damage. If this model does end up failing on you, then you’ll be happy to hear that it comes with a two-year warranty which ensures that you can get your money’s worth out of it. Despite the slightly higher price of this circuit tracer, Ideal’s excellent build quality makes this one our favorite. It’s a fantastic mid-range model for those who need a quality wire tracer without the hypersensitivity and added features that come with something like the Greenlee CS 8000. If you’re looking for a professional-grade tool that is far more capable than many of the options on our list, then this one is for you. Greenlee’s CS-8000 is an incredibly sensitive circuit tracer that features both a graph and an audible tone to help you find a circuit. When you want to work fast, you can leave this circuit tracer in auto mode, but you can also change it to full manual control. It features a receiver to transmitter distance of four miles, and it’s also compact enough to fit inside of your toolbox or equipment bag without any trouble. The Greenlee CS 800 also comes equipped with a backlight that will automatically dim itself to conserve battery life. For your money, you’ll also get a limited lifetime warranty that ensures that you won’t need to buy another circuit tracer, at least for the foreseeable future. The battery in the transmitter and the receiver can last for up to six weeks, which is reasonable when you consider this model’s heightened sensitivity and the inclusion of a display. As you would expect, the only bad thing about this model is its prohibitive price point. But for the professional electrician who needs a high level of accuracy and reliability – it’s more than worth the money. Moving on to a more affordable option, this circuit tracer from Klein is the most reliable product that you’ll find in its price range. While many other cheap circuit tracers will fail within a few weeks or may not even work out of the box, this one is both capable, accurate, and easy to use. For the lower price, you sacrifice a bit of voltage range, but this model will still work between 90 and 120V. Then flashing arrow on this circuit tracer provides you with an easy way to identify the circuit, and the transmitter can operate at distances ranging up to 1000 feet. To ensure that the battery lasts for as long as possible, this circuit tracer features and auto-off feature. You can even get your hands on a compatible accessory kit for this model, turning it into a circuit tracer kit. Some of the extras that you can purchase include some alligator clips and a light socket adaptor. You also won’t have to turn the power off so that you can use this circuit tracer, putting it a step above other affordable models. As we mentioned earlier, the only thing that disappointed us about this circuit tracer is that it won’t work with voltages over 120V. But overall: the Klein Tools Circuit Tracer is a great product which gives outstanding value for the money. Another excellent high-end product is the Fluke Circuit Tracer, and this one comes equipped with a high-quality transmitter and receiver that can make your job simple. The transmitter is equipped with a display that can show you everything ranging from transmitting level to external voltage. On the other hand, the receiver also has a display, and this will show you the receiving signal, its code, and the live voltage. This circuit tracer even comes included with a built-in lamp so that you can work in darker areas without too much trouble. The voltage range goes from 12V all the way up to 400V. This model is rated to Cat III, 300V, so you can rest assured that it’s also safer than a lot of its competitors. The auto-shutoff feature helps ensure that it isn’t accidentally left on, which would drain the battery. The only reason that this isn’t our premium choice product is that it’s a bit more expensive than the Greenlee circuit tracer without many notable advantages. 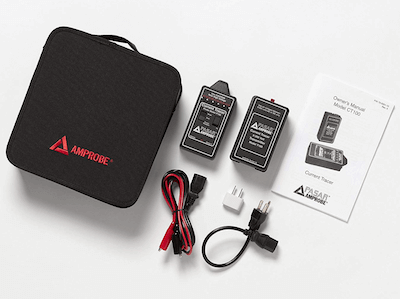 The Amprobe Circuit Tracer is a mid-range model that features a wider Voltage range than a lot of its competitors, being able to work from 9V all the way to 300V. Whether you’re looking to trace breakers or energized wires, this circuit tracer won’t require any power interruption, making the job quick and convenient. The LEDs on this tracer help ensure that you can spot a circuit with ease, and there is a digital noise filter installed that will make it easier to work with. This circuit tracer is primarily intended for industrial use, so it’s built tough and it works without causing any interference in the surrounding devices. This model also comes included with a carry case that can keep it protected when stored in your toolbag, and its simple design makes it relatively easy to use. Unfortunately, this current tracer is in a weird middle-ground where it isn’t as capable as the Greenlee CS 800, but isn’t as affordable as the Ideal 61-534. It’s by no means a bad product – it’s just in a weird place in terms of justifying it as a purchasing decision relative to its competitors. That said, Ideal’s model only goes up to 220 V. So if you’re looking for a wire tracer that can handle more than 220 V (Amprobe can handle up to 300 V) but aren’t willing to fork out extra money for a Greenlee, then the Amprobe wire tracer is a good option for you. The Fox and Hound circuit tracer from Triplett is another mid-range option that is reasonably capable. The LED head on this model makes it easy to detect and trace a circuit, and it comes equipped with a noise filter that can help eliminate any interference in the surrounding area. This model can trace wires that are up to 1000 feet long, and it can be used to tone a wide range of cables, including live wires, COAX, and more. With a voltage range that goes up to 250V on either AC or DC, this model is ideal for residential use. There are also LED headlights equipped on this circuit tracer, which help make it far easier to use in areas with poor illumination. This product is also built durably, with a moisture-resistant housing that can prevent the sensitive internal components from being damaged. A few things disappointed us with this tracer. To get it working well, you may have to adjust the RF level, and this model is a little too expensive for its capabilities. The TG20 from Extech is the most affordable choice on this list, and it’s a little more specialized than the other options. This one features a transmitter that is equipped with an RJ11 phone connector as well as alligator clips, making it more versatile, and allowing you to check phone lines with ease. Unlike other budget models, this one features adjustable sensitivity and volume controls that will make it easier for you to identify the correct wire. The non-contact probe makes this circuit tracer safer and it’s precise enough to identify a cable without too much trouble. This model can also perform a continuity test, with the LED illuminating if the resistance is lower than 10 000 ohms. Unfortunately, this circuit tracer simply isn’t capable enough for most professional applications, as it only supports voltages up to 24V, and there is no auto shutoff. The Southwire circuit tracer is an excellent option for buyers who want something basic and affordable. Its 120V max voltage means that it’s perfect for use around the home, as you’ll typically be working with smaller outlets, but it loses out on versatility since it can’t work with 240V circuits. There is a green LED on the receiver that lets you know when you’ve found the right breaker, and there is also a light on the transmitter to let you know if the outlet is live. The transmitter that comes with this model will also work on gfci outlets, which is refreshing for a more affordable wire tracer. For a cheaper circuit tracer, this one is surprisingly sensitive, which should make your work a lot easier. Keep in mind that this model isn’t ideal for professional use due to its lower voltage range and its relative lack of durability compared to some of the competition, though it’s still excellent for residential use. The Sperry circuit tracer disappointed us because it looks like a great product when you first go over its capabilities. It works with a wide range of adaptor plugs and it features adjustable sensitivity, but that’s where the good part ends. Other than that, this product is an unreliable mess. It will typically lose a circuit halfway through a trace, which often means that you’ll have to start again, and this circuit tracer also feels flimsy. A single drop would be enough to shatter this product, which is simply unacceptable in either a home or professional environment. There is also no included outlet tester with this model, and it has to be purchased separately, completely eliminating the advantage of this model’s low price point. We would recommend avoiding this circuit tracer at all costs, as it’s nothing more than a waste of money. One of the only redeeming things about this product is that it comes with batteries included (some might even say that’s the most valuable thing about this product…skip it). If you’re looking for a relatively affordable mid-range circuit tester, you’ll probably like this one from Zircon. This one comes with a variety of attachments that help make it one of the more versatile options on this list, including single blade outlet testes for nonstandard receptacles. You can use this model with voltages ranging up to 277V, and since it operates on live circuits, there is no limitation to the distance of the wires. This model can run for about 50 hours before you need to replace the batteries, saving you money on 9V cells. Helping you identify the correct circuit, you’ll see a green LED light up and you’ll also hear an audio tone, both of which help ensure that you don’t accidentally skip it. The only thing that let us down was that this circuit tracer needs to be used on live wires, diminishing its versatility when compared to other models on this list. The final product on our list is this circuit tracer from PTE, which is relatively simple and affordable. This model features a maximum DC voltage of 42V and an AC voltage of 24V, and the transmitter features an RJ11 telephone connector as well as two alligator clips. This circuit tracer cannot be used with live wires, and it features a maximum signal range of around 330 feet. Due to its affordable price, we would recommend the PTE circuit tracer for home use, as you can test circuits and trace wires with it relatively easily (though it isn’t meant for heavy-duty usage). For an affordable tracer, this model has a good degree of adjustability, making it easier to find wires or circuits that are causing problems. The build quality of this product is the only thing that let us down, as it’s clearly made for home use, and it won’t last long in a toolbox or a rougher work environment. If you only need to trace a couple of wires infrequently around the house, then the PTE circuit tracer is worth considering. But for professional use – skip it.